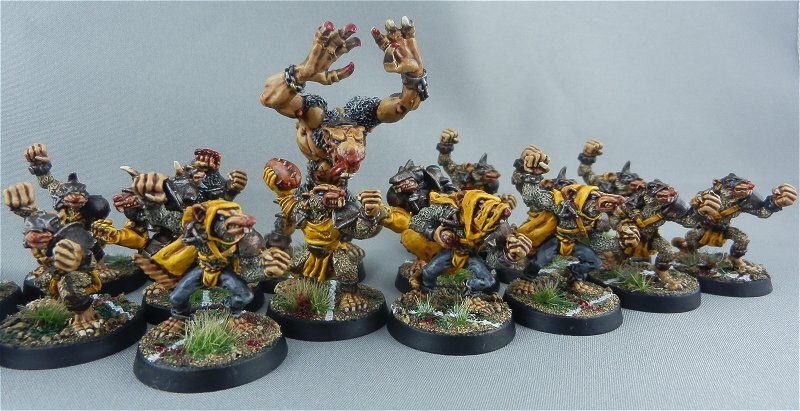 I painted this Skaven team for a mate. 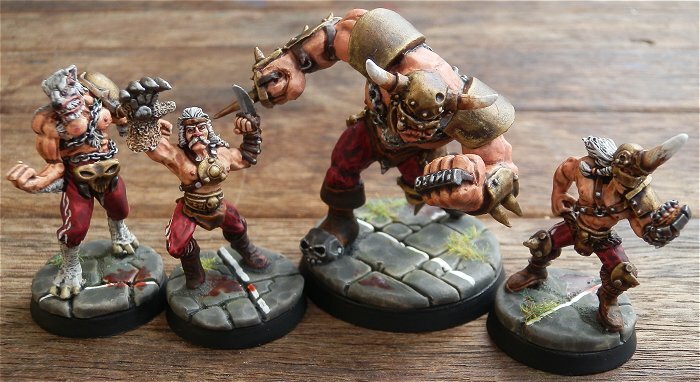 A Norse team I painted for a friend. 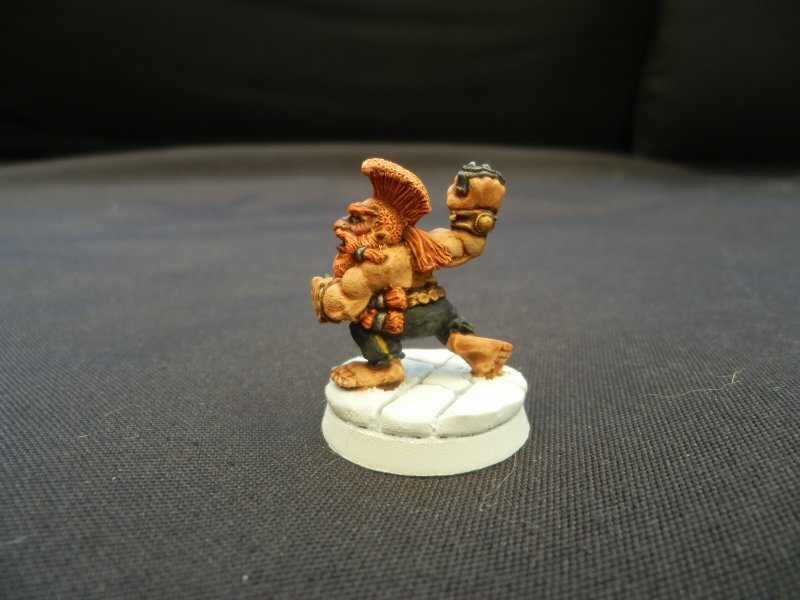 Another Perth local player asked me to paint his Chaos Dwarf team and here’s what I came up with. 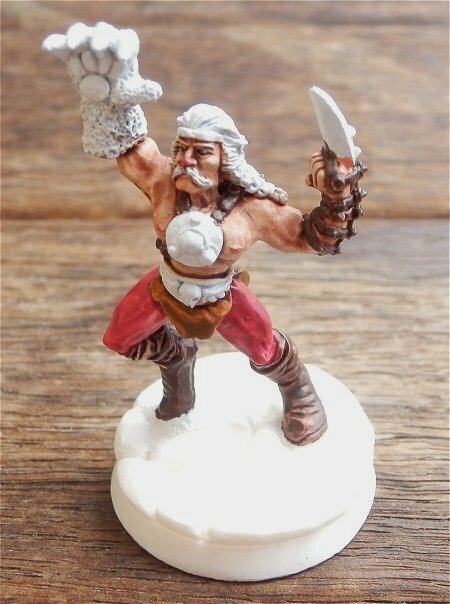 These miniatures were great fun to paint, lots of character and interesting details. 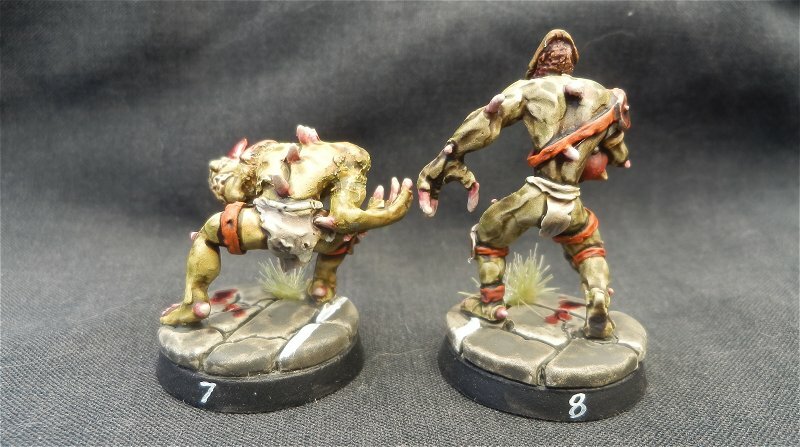 Thanks Bruno for the opportunity to paint them! 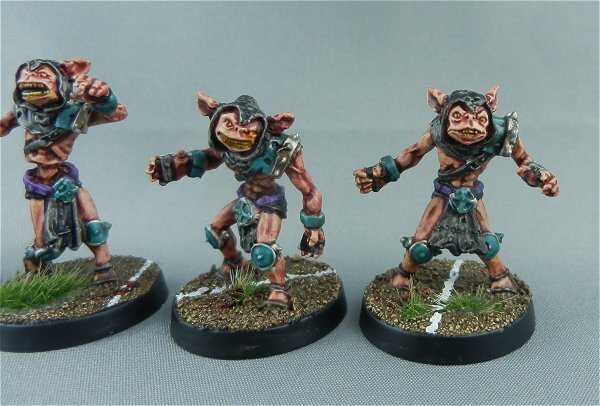 Here is a Halfling team that I painted as a raffle prize for the Sandgroper Cup Blood Bowl tournament. 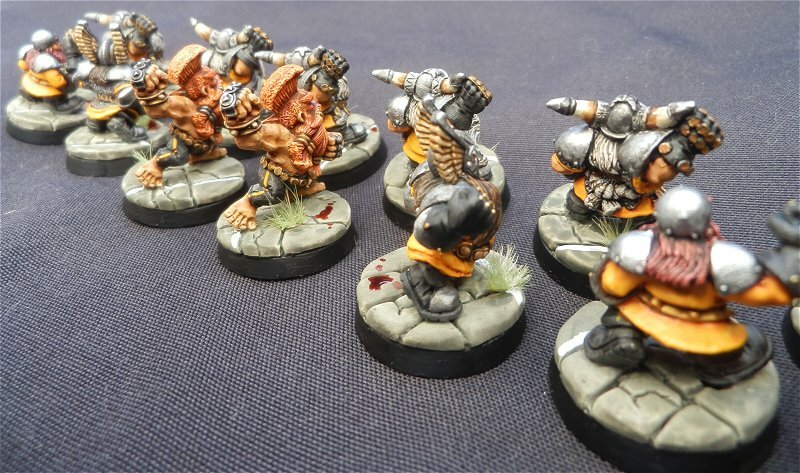 This is an Amazon Blood Bowl team I painted for a local raffle prize. 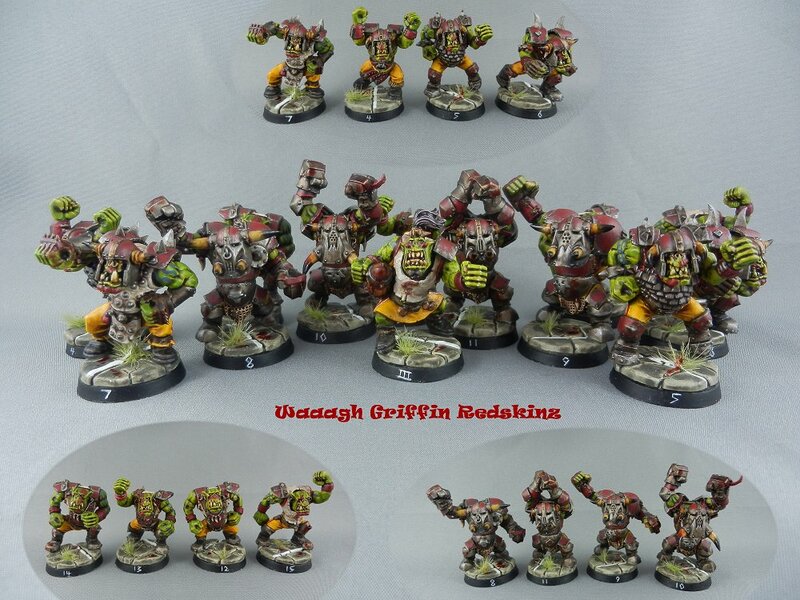 In preparation for next season, I’m getting an Orc team ready. 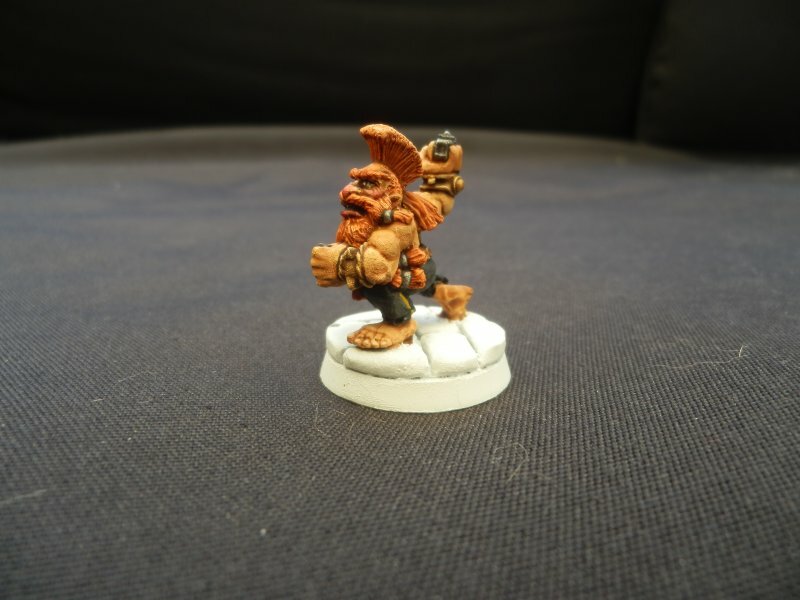 I finished the first test mini for the Redskinz. Dec 28th 2013 – Here’s a photo of the finished team. Here’s a stage by stage Gif of my star player. 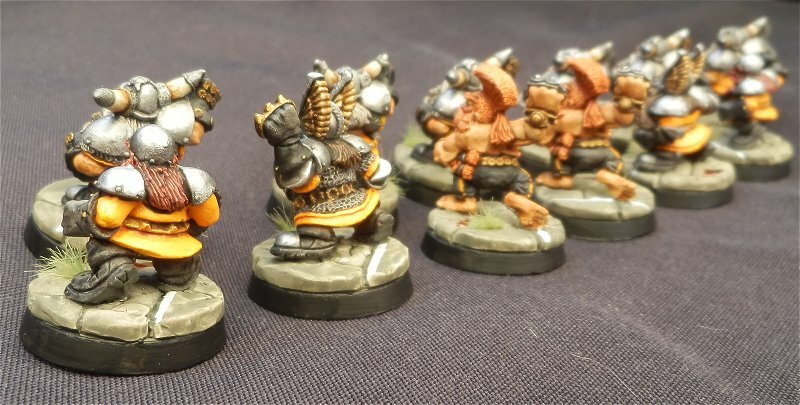 Here’s a few photos of a dwarf team I painted for a friend. 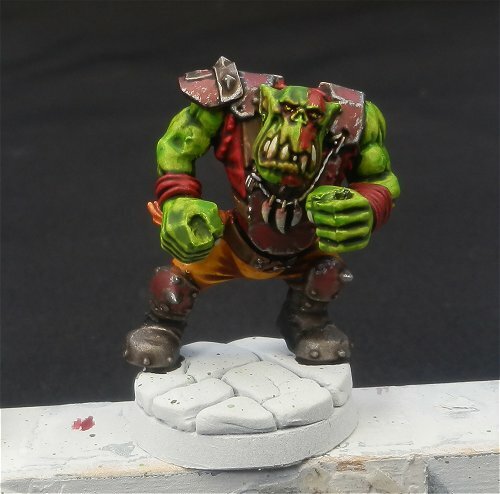 Here are a few close ups of a Troll Slayer before I finished the base. 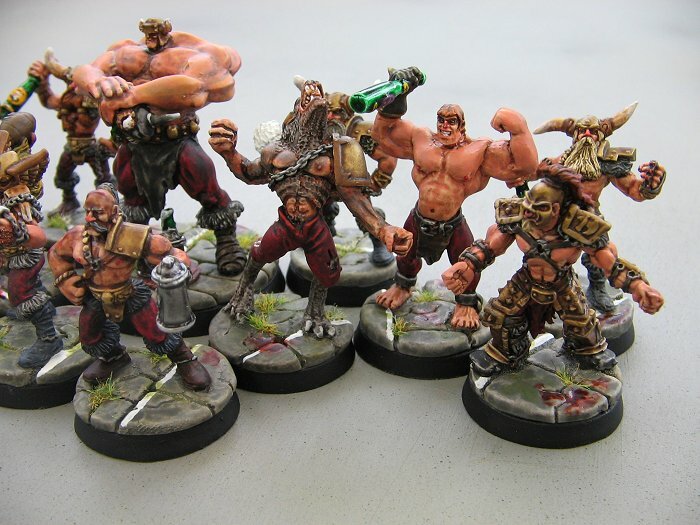 A BIG thanks to Duro for giving me the opportunity to paint his team – good fun! 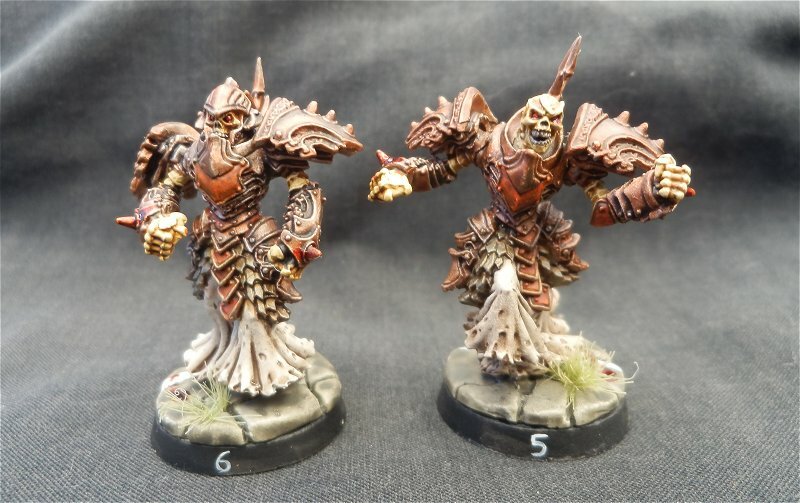 My Necromantic team – The Graveland Browns. 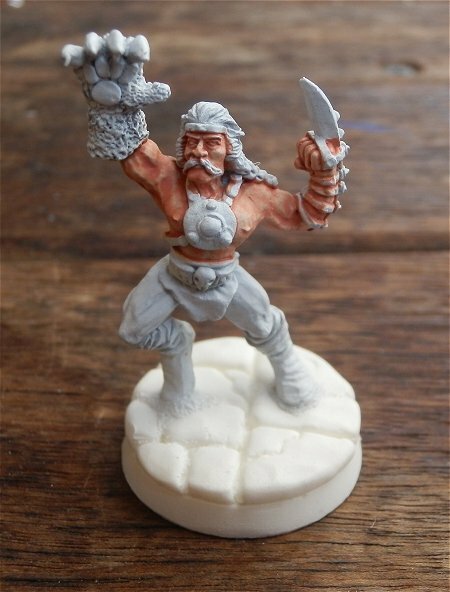 I‘ll add some more details of the paint and miniature suppliers soon. 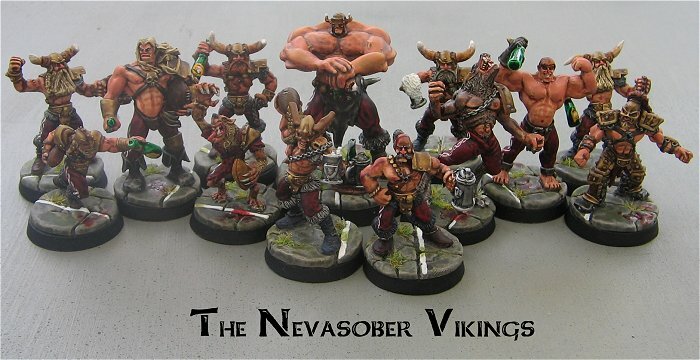 My Norse Blood Bowl team – The Nevasober Vikings. 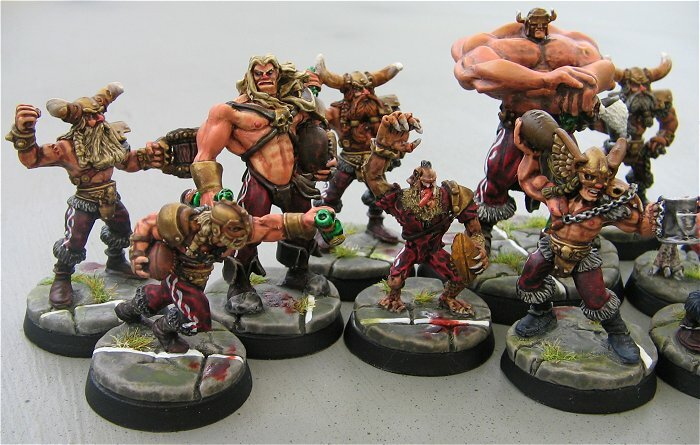 The local Blood Bowl scene here in Perth, Western Australia, is thriving so I’ve finally decided to join in. 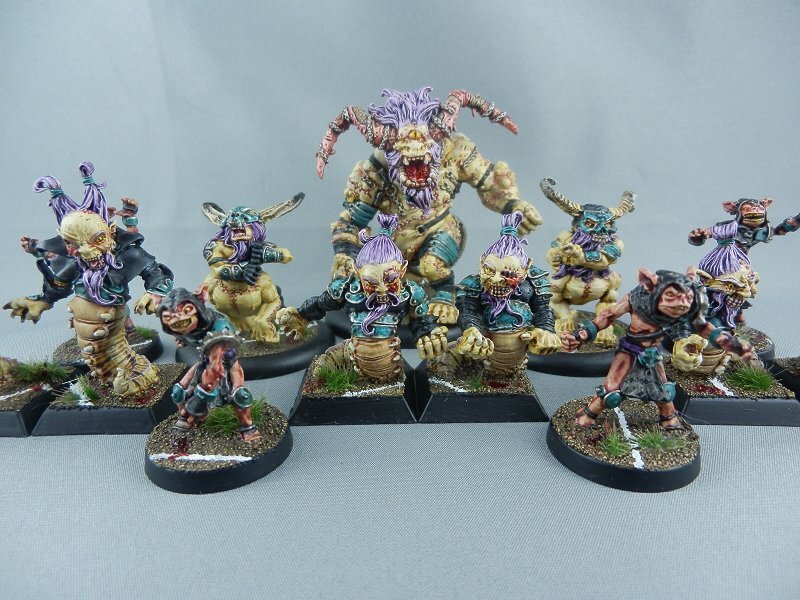 I’ve had this team sitting unpainted in a box for over 3 years! 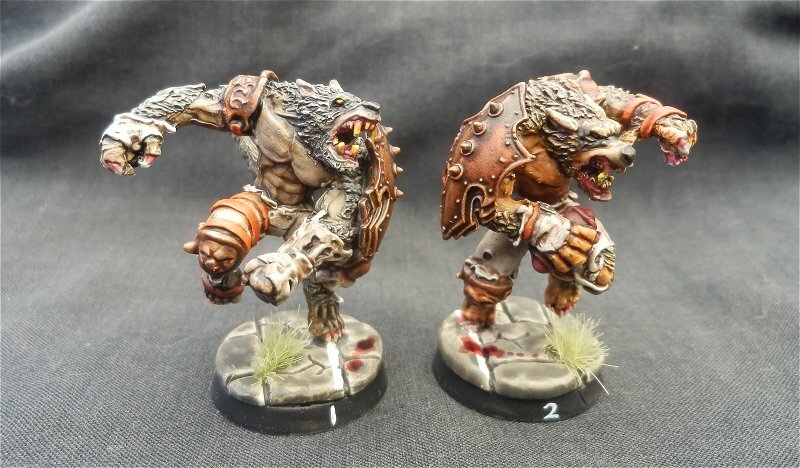 The Thrud miniature (the big guy) is from Heresy Miniatures. 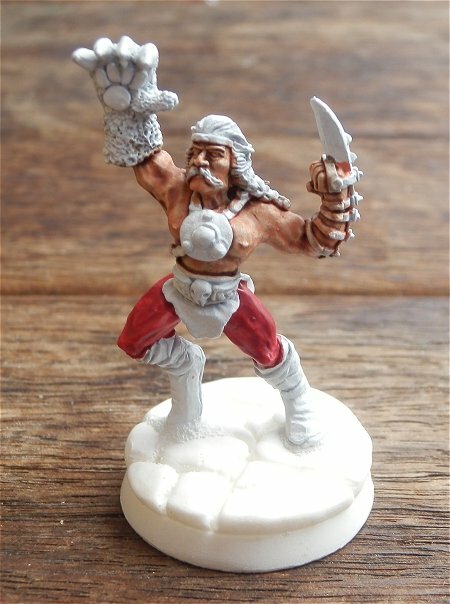 I’ve always enjoyed Thrud (showing my age there – my White Dwarf collection goes back to issue 29). 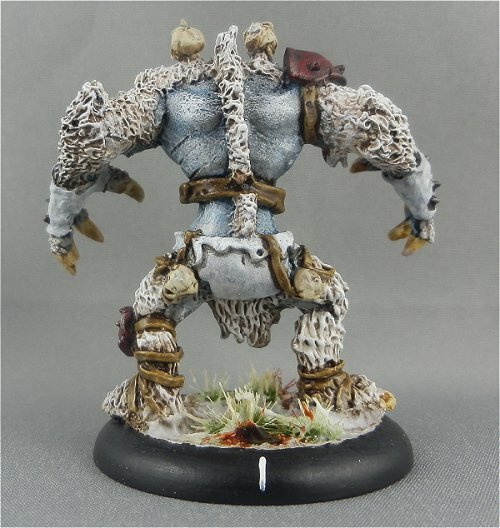 He is a perfect proxy for a Snow Troll. 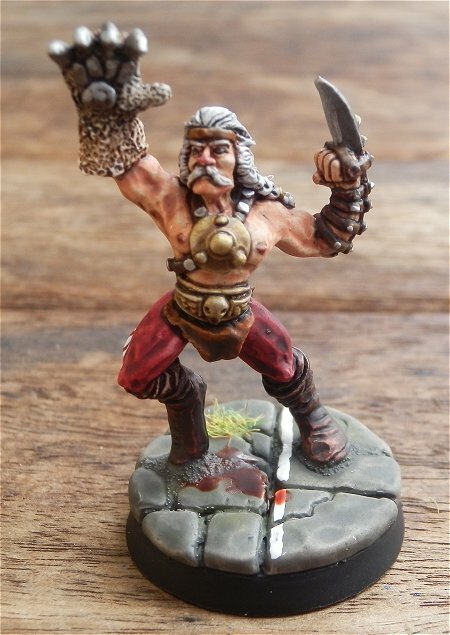 I used Deathball Barbarians for my Norse Berserkers. 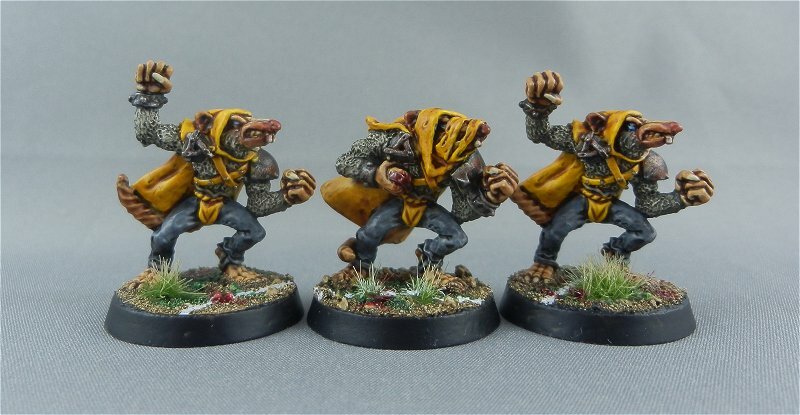 One of the Ulfwerners is a converted werewolf from West Wind Productions. The other one is from Impact Miniaturtes. 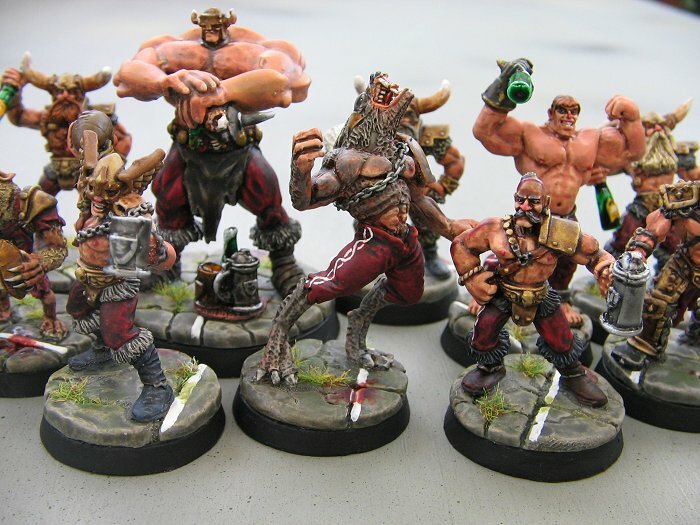 The Norse linesmen and thrower are from Games Workshop. 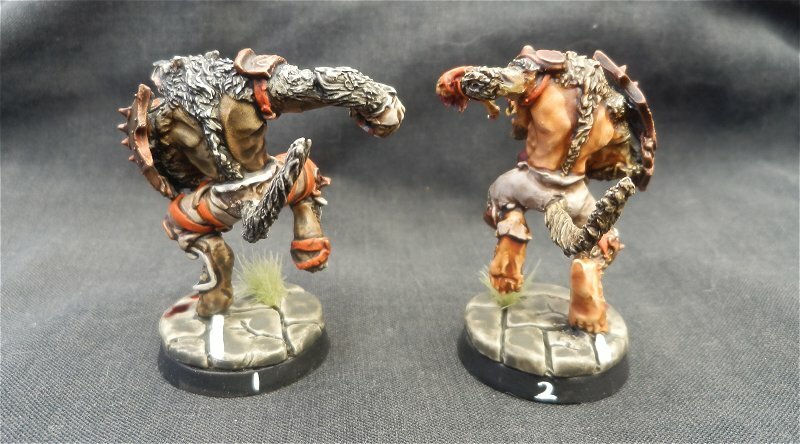 One of the Norse Runners is from Impact Miniatures and the other one is from Reaper Miniatures. I got the bottles and beer mugs from Thomarillion. 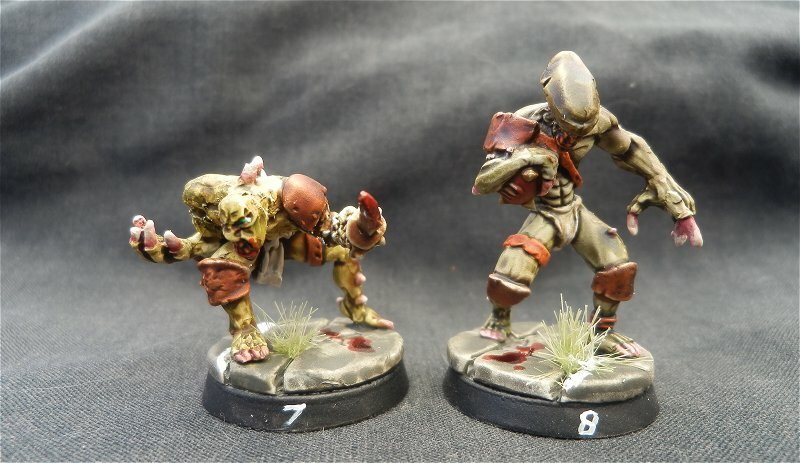 The resin bases are from Back 2 Base-ix. The big guy is a Heresy Miniatures Deathball Ogre. The werewolf (Ulfwerner) is from West Wind Productions. The 2 other players are from Games Workshop. How I pianted this team. Once assembled, the miniature was sprayed white. 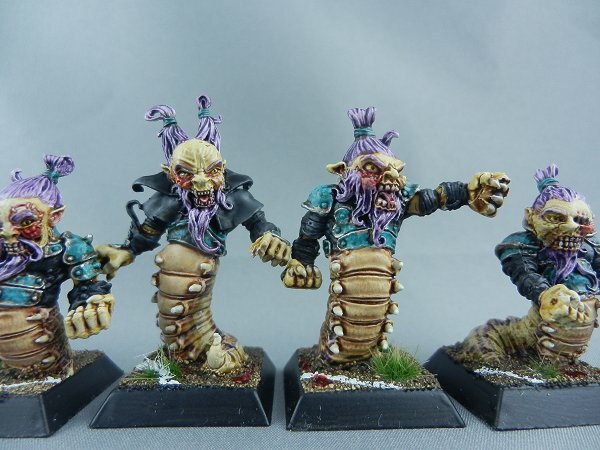 The skin areas were painted with slightly diluted GW Dwarf Flesh. 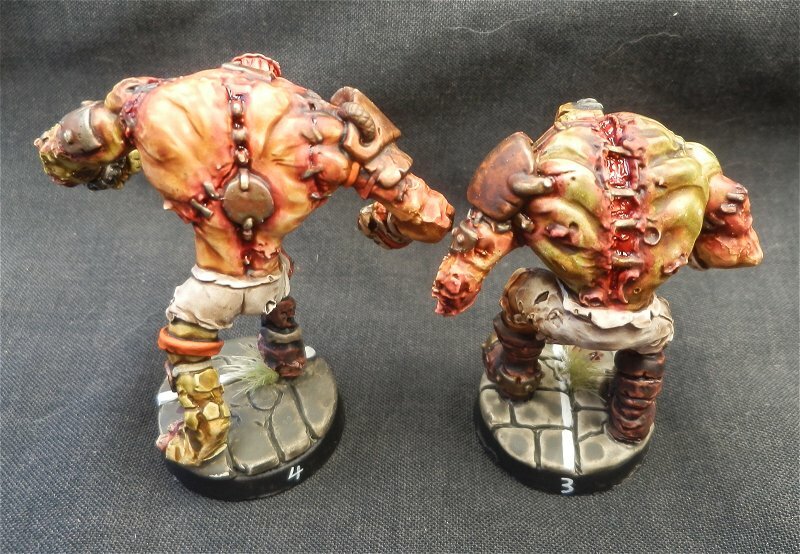 The skin areas were then washed with diluted GW Devlan Mud. 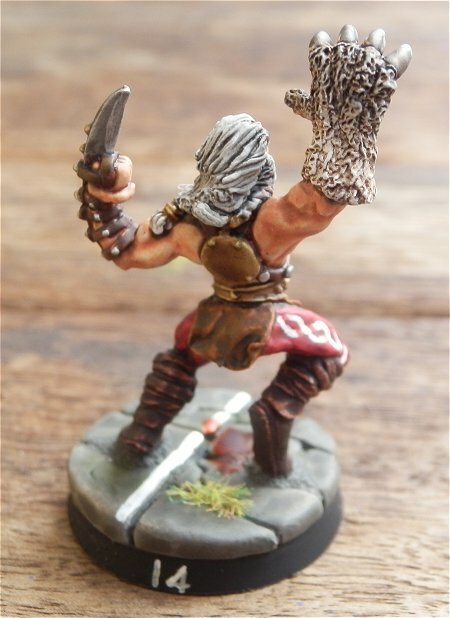 The trousers were painted with slightly diluted GW Gore Red. The boots and leather strapes were painted with slightly diluted GW Scorched Brown. 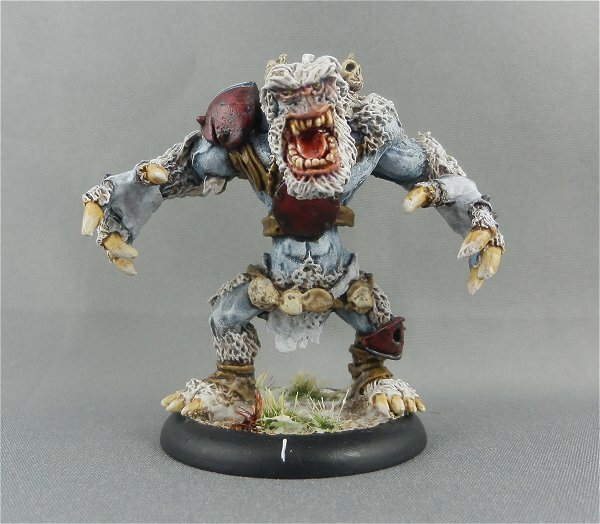 The loin cloth was painted with diluted GW Bestial Brown. 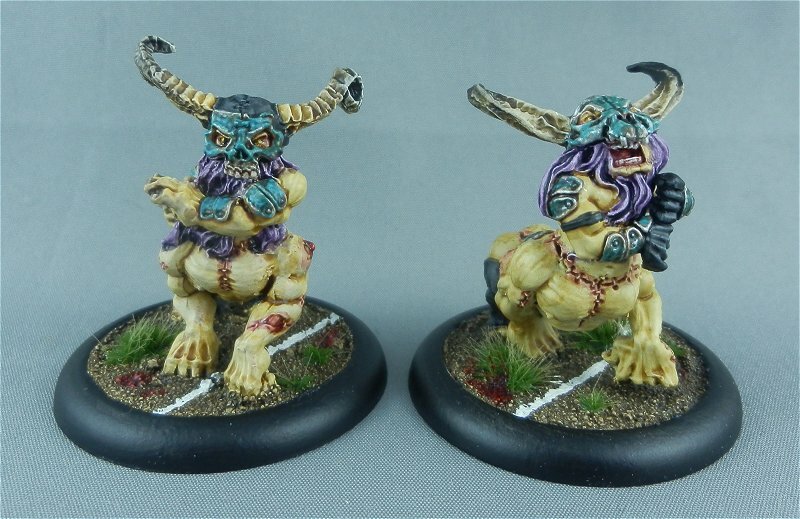 The eyes were painted using GW Chaos Black with a tiny dot of GW Skull White in the corners. 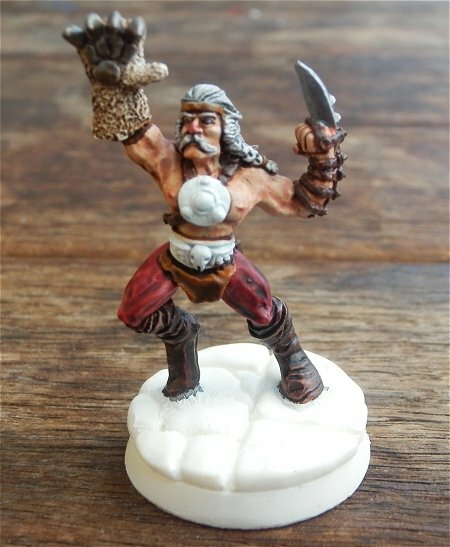 The nose was given a red tint using very diluted GW Gore Red. 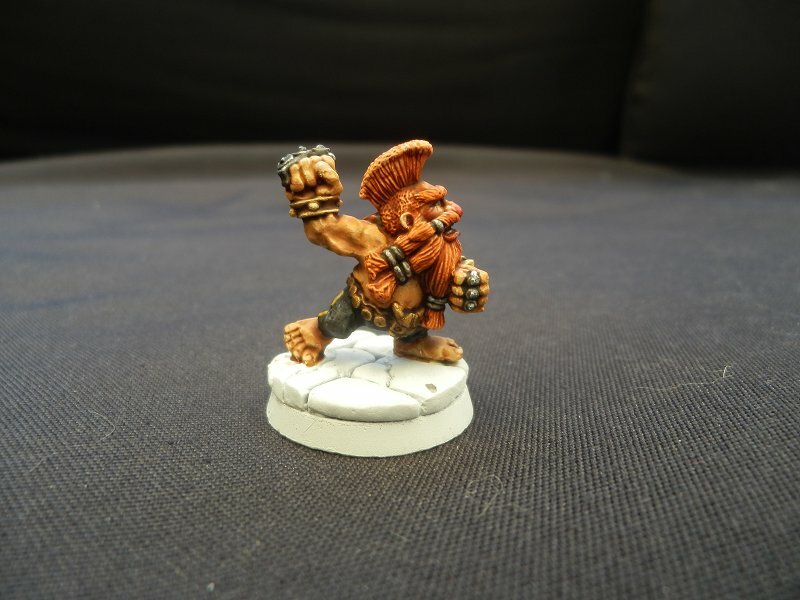 The head band was painted with GW Bestial Brown. The hair was washed with GW Badab Black. 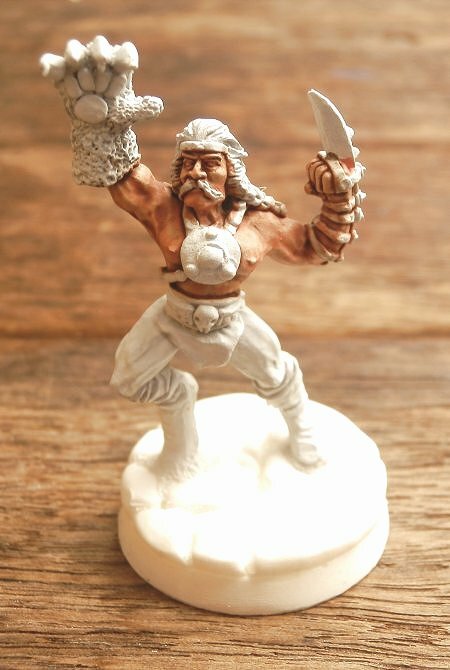 The claws of the glove were painted using GW Boltgun Metal. The Glove was then washed using Woodland Scenics Burnt Umber pigment. 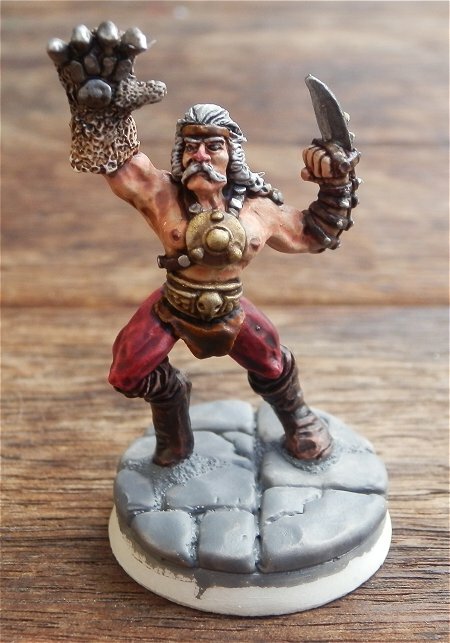 The legs, boots and loin cloth were washed using Woodland Scenics Black pigment. The chest plate and belt were painted with Vellejo Old Gold and then washed using GW Devlan Mud. The metal studs on the leather straps were painted using GM Boltgun Metal and then the leather was wahed using Woodland Scenics Black pigment. 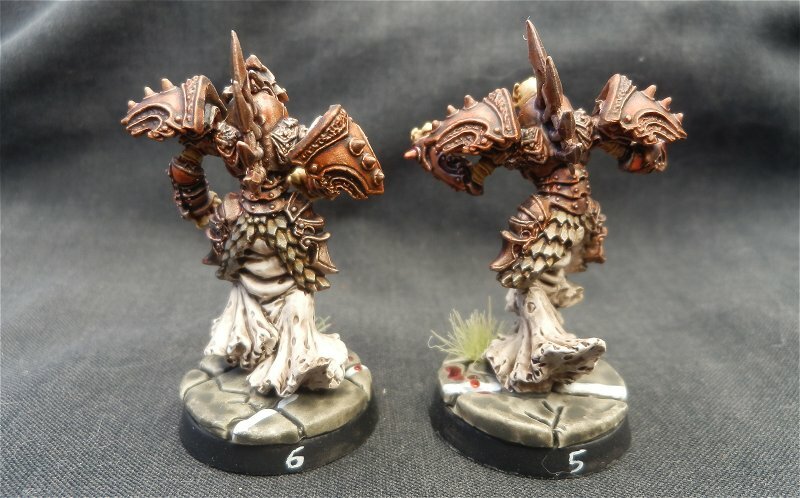 The sone on the base was painted with slightly diluted GW Codex Grey. Stripes were painted onto the trouser leg. The stone on the base was washed with diluted Woodland Scenics Stone Gray. 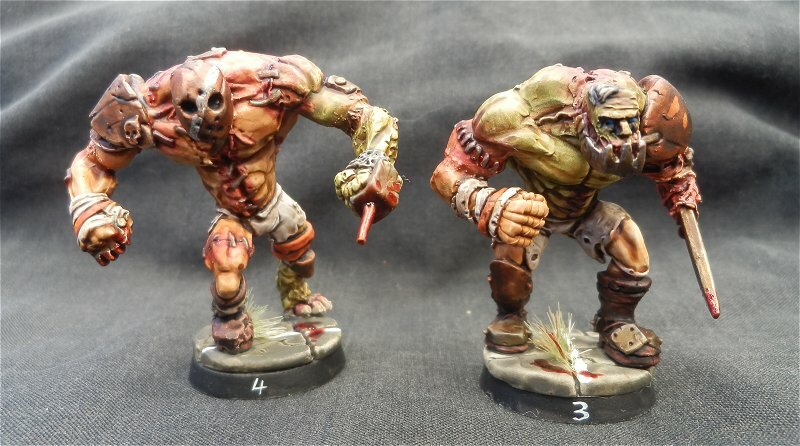 The blood splatter was painted using Tamiya Clear Red with a tiny bit of GW Chaos Black added in. PVA glue was used to hold the static grass in place. 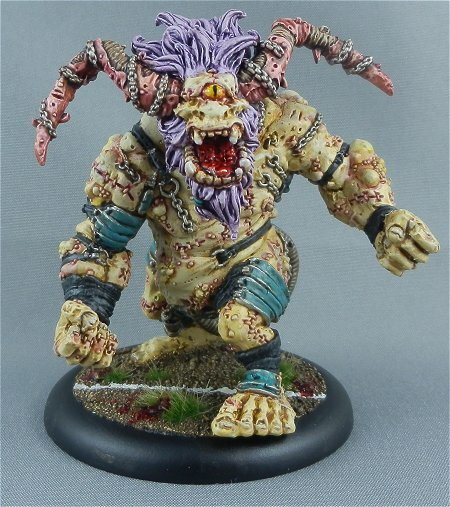 The white line on the base was painted with GW Skull White. 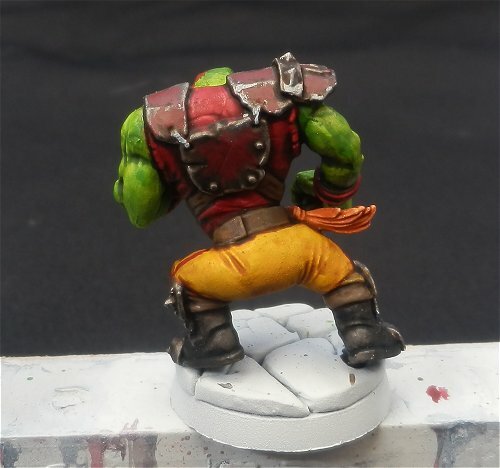 The rim of the base was painted using GW Chaos Black. 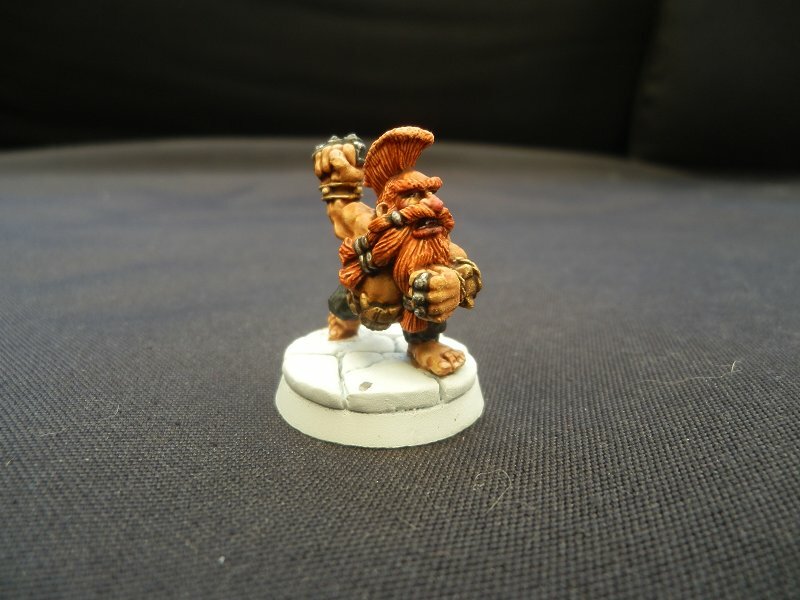 The miniature was varnished with Testors Dullcote to finish it. 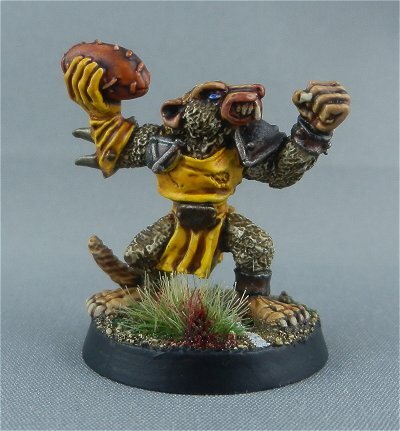 5 Responses to BLOOD BOWL TEAMS. Great job mate! Love em! 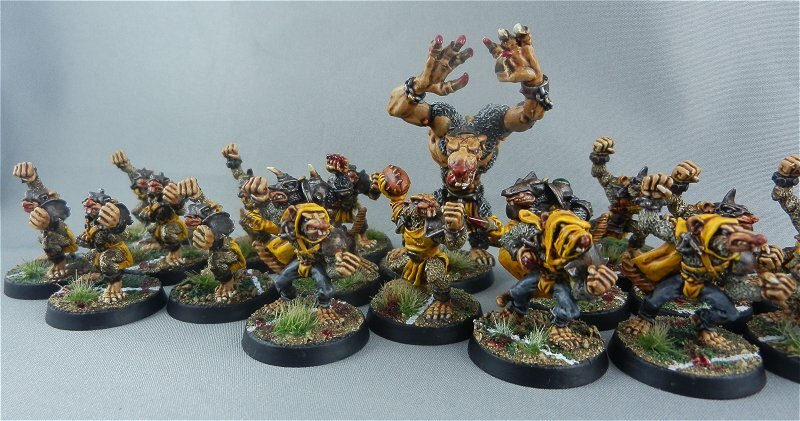 the skaven team looks a treat!